Cassidy Wallis presents her research at UBC Okanagan’s sixth annual Three Minute Thesis competition. 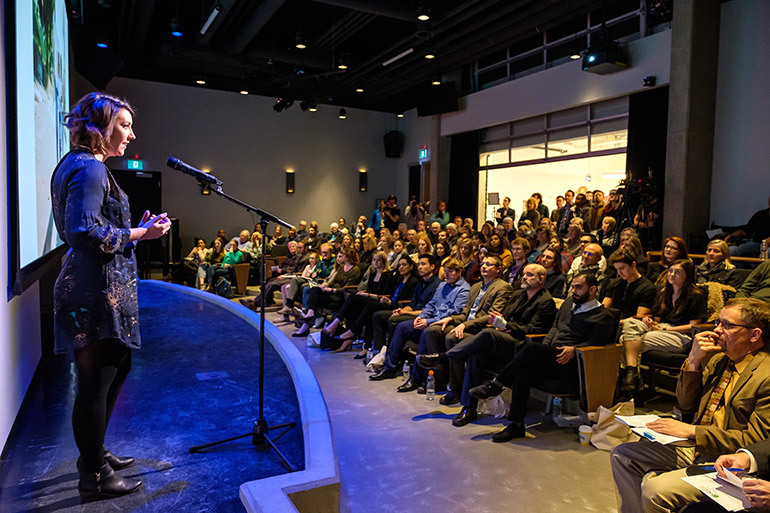 A captivating topic and plenty of passion propelled Cassidy Wallis into the winner’s circle at UBC Okanagan’s sixth annual Three Minute Thesis (3MT) competition, Thursday. The Master of Arts in Psychology student wowed judges and audience members alike with her presentation, ‘Non-offending Parental Support and its Impact on Delays in Reporting Child Sexual Abuse.’ She took home first place and the top prize of $3,000. Kelowna’s Innovation Centre was filled to capacity for the event, which saw eight graduate students take three minutes each to explain years of research to audience members. “The 3MT event provides an incredible opportunity for our campus and the community at large to get a snapshot of the amazing research being conducted by our graduate students,” says Dwayne Tannant dean pro tem of the College of Graduate Studies at UBC’s Okanagan campus. As the winner of the 3MT final, Wallis will travel to this year’s Western Regional 3MT Competition hosted by the University of Northern British Columbia in Prince George on April 17. From there, the top three presenters will win an opportunity to compete in the nationals, hosted by the Canadian Association of Graduate Studies.